Сеть продуктовых магазинов в городе Череповец - Чикаго, крупнейший дистрибьютор продуктов питания, кондитерских изделий, алкоголя, выпечки, фруктов и другой продукции. 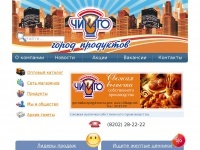 The web server used by Chikago.net is located in Russia and run by Beget Ltd. The website Chikago.net has a own web server. The web server only runs this website. The websites of Chikago.net are served by a Nginx server. The markup language of the website is XHTML 1.0 Strict. The visitor analysis software Google Analytics is used to analyze the visitors of the websites. The website does not specify details about the inclusion of its content in search engines. For this reason the content will be included by search engines.